The famous communication software Skype allows you to make phone calls free between computers via the Internet. To improve this communication tool, it would be useful to record telephone conversations between friends in MP3 format to keep a copy of backup . I suggest trying the utility Skype Recorder Auto. recording in MP3 format at 320 kbps 48kHz. possibility of increasing the volume of the recording. 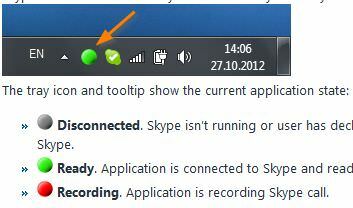 A dedicated icon fits in the area of notification of Windows to see the status of the current record. An excellent utility to record your Skype conversations. A download of Skype Recorder Auto .